Easily and quickly create distinctive envelopes for your handmade cards, boxes, and more using the Simply Scored Diagonal Plate, created by and exclusively for Stampin' Up! This "must have" crafting tool is reasonably priced at $11.95. Cut the Lucky Limeade Card Stock to 7 3/4 x 7 3/4". Score the first two opposite corners at 4 1/8" using the Simply Scored Scoring Tool. (Don't forget to use the markers so it is easy to see exactly where to start your score line). Score the remaining two opposite corners at 3 1/8". Crop the little triangle pieces using the Stampin' Up! 1 1/4" Square Punch or Paper Snips. Fold in sides. (if you fold in the two shorter flaps and then line up one of them with the bottom edge of your Paper Trimmer and then move the "point" on the longer flap sticking out to the right with the silver edge on your Paper Trimmer, you can cut off the perfect amount to make it look like a "purchased" envelope. Adhere the bottom flap (only put glue or SNAIL near the edges of the flaps so it won't stick to the inside of your envelope). Once you are ready to seal the envelope to mail, put on a little more adhesive and give the back of your envelope a few good swipes with a bone folder to help it stick securely. 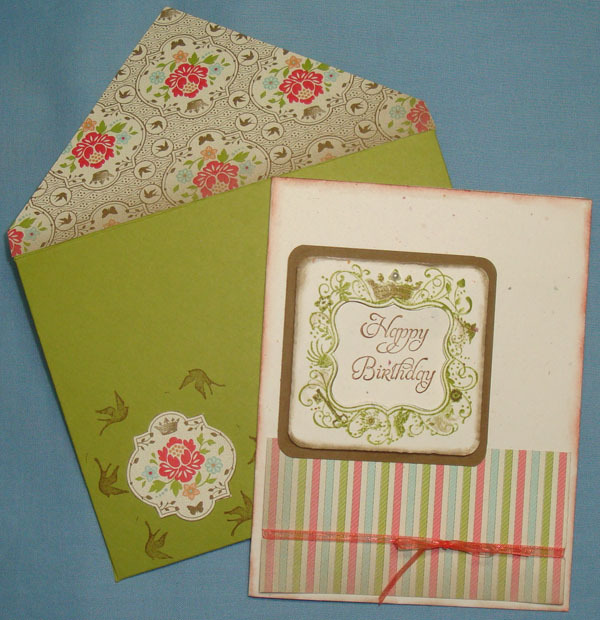 I'll be showing more samples and cardmaking ideas this coming week so be sure to check back. cardmakinghandmade cardsstamp mavenstampin up demoStampin' Up!